Merle Wood & Associates is pleased to announce that the HUNTRESS II yacht sold this week to a discerning yachtsman. With accommodations for 12/14 guests in 5 staterooms, the classic Feadship features a full-width master suite on the main deck with a private office, a large en suite bath, and an observation lounge. The 4 guest staterooms are on the lower deck, and each features 2 double beds with either a Pullman berth, or a sofa, as well as its own well-appointed en suite. 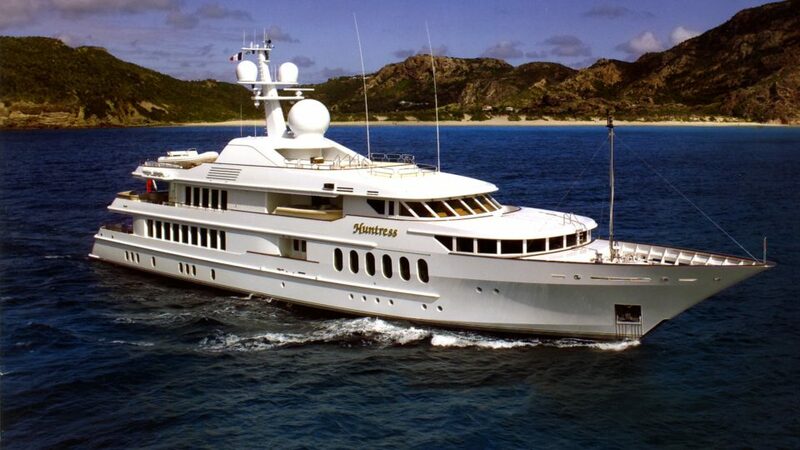 Having the HUNTRESS II yacht sold represents yet another Feadship that Merle Wood & Associates has represented. No other brokerage firm has sold more top Dutch pedigree yachts than we have, whether representing the seller or buyer (including new yacht construction). Having had only 2 owners since new, the HUNTRESS II yacht sold with new soft goods, new exterior paint, and mechanical updates and upgrades. With an elegant interior by Terence Disdale, neutral tones in the furniture, carpeting, and ceiling complement the flood of natural light pouring through the oversized windows. The main salon features a full bar upon entry, as well as hardwood floors and a large sofa lounger. Moving forward, the floor becomes carpeted, and grouped furniture forms excellent conversation spaces. A white piano sits to starboard, while further forward, the formal dining area features a round table and chairs, and is also surrounded by the same large windows as in the main salon. Her large skylounge features neutral tones coupled with a seafoam green pattern on the soft furnishings, as well as large windows that offer sweeping views. The HUNTRESS II yacht sold with expansive deck spaces that offer abundant areas for socializing, entertaining, and dining. The main deck aft offers a built-in bench sofa faced by two tables and loose settees, and is a great space for parties or a light breakfast. Her sun deck features a full bar with built-in chairs, a sauna, and plenty of sunpads on which to relax after a dip in the Jacuzzi. Additional amenities on board include a dedicated gym, as well as a host of water toys. Two Caterpillar engines propel the yacht to a top speed of 15 knots and a cruising speed of 12 knots. Built of a steel hull with an aluminum superstructure, she is classed to Lloyd’s and is MCA-compliant. Many thanks to the corresponding brokers who assisted in the marketing of this vessel, and congratulations to luxury yacht broker Merle Wood for the sale. For more information on motor yachts for sale that are similar to HUNTRESS II, please contact Merle Wood & Associates. For additional information, read the full HUNTRESS II yacht specs or view the HUNTRESS II yacht price and details. For information about the HUNTRESS II yacht, or for expert knowledge from a qualified yacht charter broker, simply contact the luxury yacht brokerage firm of Merle Wood & Associates for assistance.